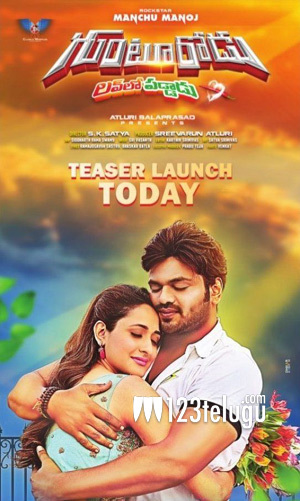 Manchu Manoj and young beauty Pragya Jaiswal-starrer romantic action entertainer, Gunturodu, will have its teaser launched in a short while today. The film’s teaser was supposed to be unveiled on the 7th is this month, but the team postponed or due to Jayalalithaa demise. Gunturodu, with the tagline Love lo Paddadu, is being directed by debutant SK Satya and produced by Sri Varun Atluri. Sri Vasanth is the music composer. The film’s shooting nearing its completion and the makers will release it in early next year.